So you’ve been told, think, or know you need a footorthotic. What kind should you get?? Do you get a “Custom” one or one off the shelf? In reality, there are so many different choices it truly takes a knowledgeable professional to help you with this. Otherwise, you are rolling the dice, betting your money on the product you buy. Why? Having multiple purchase options available, along with guidance in determining which type of orthotic will better help you find success and save you from wasting your money and time. Sound complex, it is. 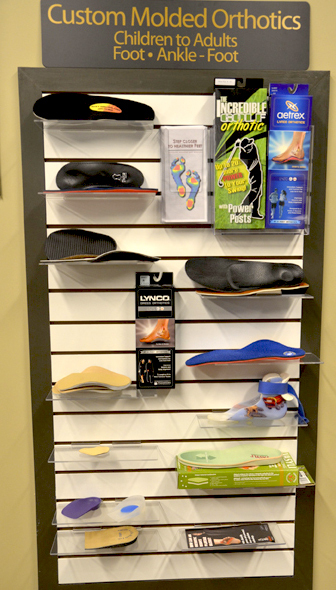 At ArchMasters, we have over a dozen different types of pre-made orthotics. We choose these many varieties, as we know the many varied types of feet people have. 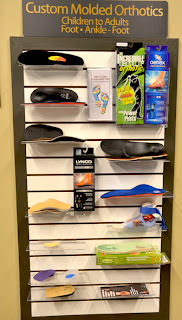 We strive to help you choose the ideal pair for your specific foot structure and function needs. We can guide you into a pair that will usually work for the type of foot you have. You will feel the difference as you test them on our concrete walkway or our treadmill. What About Just Getting A Good Comfort Shoe? The “Comfort” shoe industry is making shoes that cushion and function like an orthotic. Many of the comfort shoes now come with their own orthotic insole. But remember, after all, they cannot have their insoles have too much correction; otherwise it will become too prescriptive, which decreases the number of people able to wear them. These companies are gambling that their specific pre-made orthotic will accommodate a large volume of people. Sometimes they feel great and help a lot, sometimes not. So don’t let someone suggest that you get this specific type of shoe and when you buy it expect that it will help you because it helped him or her. It would be the same as them handing you their pre-made glasses and saying, “Try these, I see great with them!” Comfort shoes, as pre-made orthotics come in a variety of shapes, sizes and corrections. Your best bet is to have a professional not only fit you, but also, guide you based on the structure and function of yourfeet. Count on ArchMasters-Orthotics, Shoes & Footcare, llc. To help you with your needs. Call us today at 615-554-8955 or just stop in. ArchMasters, a shoe store and a whole lot more!